Shin Tae-yong successfully came to South Korean football's rescue on Tuesday as their new head coach, helping the national team qualify for the 2018 FIFA World Cup. South Korea clinched their ninth consecutive World Cup appearance after getting a scoreless draw at Bunyodkor Stadium in Tashkent. Heading into the last match in Group A in the final Asian qualifying round for the 2018 FIFA World Cup, South Korea were second with 14 points, just two points above Syria and Uzbekistan. 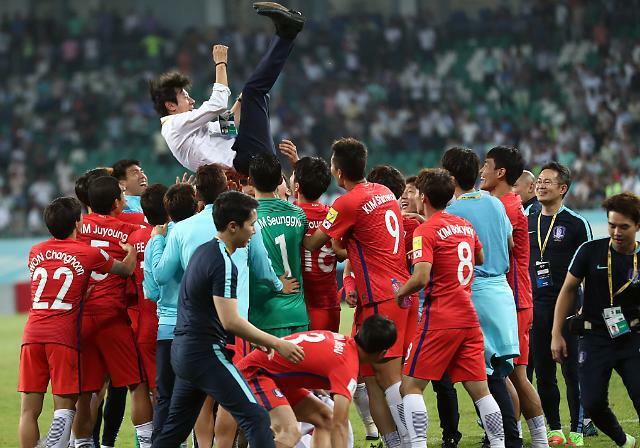 A win over Uzbekistan would have assured South Korea's place at the World Cup no matter what. Shin's side failed to collect a win, but still achieved their goal in the end after Syria played to a 2-2 draw with Iran. "It's a pity that we couldn't win here, but I want to thank all fans here and South Korea that we're able to qualify for the World Cup with a draw," Shin said at the post-match press conference. Shin, who took over the team in July, collected a 0-0 draw with Iran last week and now with Uzbekistan. Though South Korea's World Cup qualification wasn't quite as pretty as many fans had hoped, Shin vowed that he will show a different South Korea at the World Cup. "We will prepare for the World Cup thoroughly," he said. "I'm a man who likes to play an attacking football. 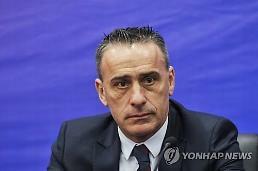 People will find out about South Korea's true football power at the World Cup." Shin said his players didn't know about the match result between Syria and Iran until the final whistle. He thanked the players for keeping their composure and concentration until the end. "Because we had a draw at home against Iran, the players were under pressure to collect a win," he said. "But they kept a high level of concentration." Shin said he knew the Uzbeks would come forward aggressively from the start, and thus his team was hoping to score a goal in the second half. Although South Korea failed to get on the board, Shin said it was still a meaningful try. Shin replaced Uli Stielike, who was sacked due to some poor performances. Many pundits then said it was a good choice for the Korea Football Association (KFA) because Shin had been able to produce solid results over a short period of time during his career. Before managing the senior squad, Shin previously took the under-23 squad coaching job just a month before South Korea started their qualification for the 2016 Asian Football Confederation (AFC) U-23 Championship -- which also doubled as a qualifying tournament for the Olympics. For the under-20 side, he was named the new boss just six months before the start of the FIFA U-20 World Cup at home. On both occasions, Shin managed to send the team beyond the group stage. At the Olympics, South Korea reached the quarterfinals under Shin's guidance, while at the U-20 World Cup, the hosts reached the round of 16 after coming out of the so-called "group of death," featuring eventual tournament winners England, six-time champions Argentina, and African outfit Guinea. But with the senior team's World Cup qualification, the situation wasn't all that rosy for the 46-year-old. Many argued Shin really took the poisoned chalice this time.